How do we know it is dry eye disease ? It would seem that the Diagnosis of Dry Eye Disease must be simple because what we are looking for is simply eye dryness. But, in fact, the diagnosis of Dry Eye Disease is often a little bit more complicated for multiple reasons. The main reason is probably that Dry Eye Disease is based on a complex dysregulation of the functional anatomy of the ocular surface that involves many factors and thus pathways. However, by using various diagnostic methods and tests, it is possible to narrow down the causes. One issue is that Dry Eye Disease may actually also cause an increased tear flow - this occurs particularly in initial states, when the functional ocular surface is still relatively intact and the regulating neural system not yet impaired. Increased tearing then is a reflectory answer of the ocular surface functional unit to the increased mechanical frictional rubbing or spots of hyper-osmolar stress that occurs at the bulbar surface because the stability of the pre-corneal tear film is already reduced. In addition, when we look to the pathophysiology, there are different primary types of Dry Eye Disease. They depend on different types of pathological tear film deficiency and these in turn depend on different causative factors. To find out which exact type of tear film deficiency occurs in a specific individual patient can become a little more challenging than just to look for a ´dry eye´. Also, what we eventually try to achieve is not mainly a diagnosis - because this is only a pre-requisite to find a suitable therapy. Different causative factors as well as different types of tear film deficiency require different therapeutic approaches in order to solve, i.e. heal the problem if possible, or to provide a sufficiently effective improvement of signs and symptoms. An exact diagnosis of the condition in the individual patient thus often requires the application of a set of different diagnostic techniques … and the respective equipment … and some patience. An experienced clinician may often make the basic diagnosis Dry Eye Disease relatively intuitively by several direct and indirect signs. For a more exact sub-classification that appears necessary for an effective therapy in light of the advanced knowledge on the pathophysiology of the disease, more advanced equipment for specific questions is necessary. This does not only make the diagnosis more exact and thus correct, but it is useful in order to follow the course of disease and the treatment effect on a rational basis of hard numerical data. Another advantage of highly advanced technical equipment often is the possibility to make measurements ´Non-Invasively´ (´NI´) , i.e. to measure a parameter, or a diagnostic surrogate of it, without interfering with the system that is to be analyzed, i.e. typically without touching the eye or without interfering with the tear film by adding staining analytic substances into it, etc. The process of DIAGNOSIS becomes easier to understand when we remember the basic course of pathophysiology in DRY EYE DISEASE because this indicates events that can be analyzed. BASIC CAUSATIVE FACTORS, i.e. a deficiency of tear secretion and/or a deficiency of tear film formation, lead to the PRIMARY PATHOLOGIES of Tear FIlm Deficiency of different type and/or Ocular Surface Tissue Damage of any kind (which both certainly influence each other). Both of the Primary Pathologies area governed by Sequences of SECONDARY PATHOGENETIC FACTORS. All explained factors and events may represent potential targets for Diagnosis. In order to make a valid diagnosis for Dry Eye Disease it is easiest to go along the alterations that occur to the ocular surface that produce the signs & symptoms of the patient. 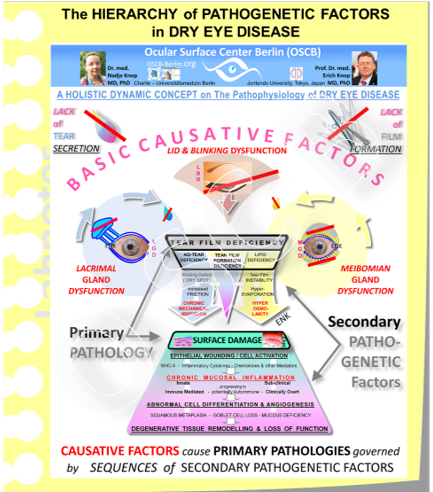 They are dictated by the pathogenetic events that occur in the course of the disease as explained in the chapter about the ´Hierarchy of Pathogenetic Factors´ or shown on more detail in the Animated ´Holistic Dynamic Concept for Dry Eye Disease´. The basic causative factors are a deficiency of tear secretion (by the aqueous gland and lipid glands (shown on the colored discs to the left and right) and a deficiency of tear film formation (indicated by the half closed eye lids in the upper middle). Therefore diagnostic tests must evaluate which of the potential causative factors is indeed present in an individual patient and to which degree. The different aspects of pathology are shown in the middle. The primary pathologies of tear film deficiency and of surface damage are both governed by sequences of secondary pathogenic factors that are linked by downstream arrows. Many of these pathologies can be diagnosed by different tests, as described below, that reveal the presence and/or degree of such pathology. A helpful diagram that shows the main factors for onset and progression of Dry Eye Disease is therefore shown here and it is below used as a template to see where Diagnostic Techniques provide information and what information they are supposed to find. Questionnaires do not only save time because the patient can answer them already without the help of the clinician and while he or she is waiting. In addition a questionnaire obtains a number of suitable and also standardized and thus reproducible parameters concerning the status of the patients ocular surface. This is useful for a better impression of the severity before the clinical investigation and for a standardized follow up of the course of disease and the success of therapeutical interventions. A good questionnaire has to fulfill the somewhat opposing aims of being as short as possible while providing as much information as necessary. This is even more important as the questionnaire should be completed by the patient before every visit and clinical examination. There are several useful and validated questionnaires around for Dry Eye Disease. The shortest and still very useful is probably the SPEED (Standard Patient Evaluation Eye Dryness) Test that was originally developed by Donald KORB in Boston, MA. The SPEED Test questionnaire form can be downloaded from the homepage of Dr. Korbs Eye Clinic (http://korbassociates.com/assets/SPEED-Questionnaire.pdf). Several other useful and validated questionnaires for Dry Eye Disease exist, such as the OSDI Test that is more detailed but also requires more time to be completed. The pre-ocular Tears are lined at the upper and lower Lid Margins by a fluid rim that contains more tears and is termed the TEAR MENISCUS. It sits on the posterior lid border and its bottom is the Line of Marx, that, in turn, represents the surface of the muco-cutaneous junction (MCJ) - a specialized epithelial transition zone that transforms the aqueous-wettable mucosa of the conjunctiva into the oily-dry skin. In cross-section (left image), the tear meniscus has a roughly triangular shape where the back side is constituted by the cornea, or the conjunctiva, and the frontal anterior side forms a parabolic curve. The filling and thus volume of the tear meniscus corresponds to the volume of the pre-ocular tears. Analysis of the meniscus thus provides surrogate parameters for the tear volume. With increasing tear volume the apparent height, i.e. the apparent upper end of the tear meniscus, increases and the curvature, i.e. the radius of the circle that best approximates the parabolic anterior surface of the tear meniscus, becomes larger (please see the diagram). With decreasing tear volume the opposite changes occur. Decreased tear volume typically causes increased mechanical friction. When the decreasing tear meniscus is due to increased evaporation, which is the most frequent case this also leads to tear hyper-osmolarity (The relative thickness of the tear film and of its lipid layer are exaggerated in the drawing, relative to the tissue of the lid margin). If we exclude a potential reflectory hyper-secretion that is typical but only present in initial states, we can start with the question how to diagnose dryness, i.e. a decreased volume of tears. Low tear volume is probably the smallest common denominator in Dry Eye Disease, that applies to most forms of dry eye - therefore this condition has its name not completely undeserved. Topographers provide a wide array of Tests and Investigations for the Ocular Surface and Tear Film and can thus not only assist in the Diagnosis of Dry Eye Disease but also in e.g. contact lens fitting by measuring the ocular surface Topography. The Oculus Topographer 5M is available with an advanced software package termed as´Dry Eye Report´from Jenvis, Jena Germany. This allows to fill in the complete Dry Eye Data Set including the questionnaire and ´digests´ the data into a graphic visualized report representation that allows even the novice in the field to perform a thorough and understandable Dry Eye Diagnosis. A reduced volume of tears results in a thinning of the pre-corneal tear-film which may already be detected by the behavior of particles and minute air bubbles upon slit-lamp examination in the inter-blink period after eye blinks. Relative to the decrease in tear volume on the eye and thinning of the tear film also the tear meniscus will change: Increased volume of pre-ocular tears will fill the meniscus and make it ´larger´ and thus its apparent height larger ... whereas decreased volume will make the tear meniscus ´smaller´. Simple estimation of the meniscus is often called a high or a low tear meniscus. More sophisticated measurements of any kind are often referred to a `meniscometry´. even though the tear meniscus is a parabolic curve there seems to be an apparent visible ´end´ of the meniscometry that appears to an observer as its´height´ - and this height increases relative to the amount of tears. in advanced Dry Eye Disease when folds of the conjunctiva are lying over the posterior lid border and thus under or inside the tear meniscus, these can artificially lift-up the tear meniscus and may therefore produced a false impression of sufficient tear volume as observed by PULT and PULT. the radius curvature can be measured by different techniques that usually project regular patterns onto the meniscus and derive its curvature from the grade of distortion of the reflected pattern by the curved meniscus surface. Analysis of the BLINK PATTERN is an important feature of Ocular Surface and Tear Film investigation- but this is typically not supported by available devices. Blinking is of utmost importance for the correct formation of the pre-ocular tear Film and its lipid layer (TFLL) because even a sufficient amount and delivery of lipids from the Meibomian Gland does still not render an intact and stable tear film when the blink pattern is disturbed and e.g. partial blinks occur. Partial blinks are difficult to record manually in particular when the patient is aware of this. Much easier and more reliable is an automatic recording of the blink pattern together with investigations suh as lipid layer thickness, as seen here with the Lipiview, or of Non-Invasive Break-Up Time (NI-BUT). that lead to a quantitative or qualitative impairment of the normal lid function and tear film formation. Therefore the spectrum of LBD is very wide and certainly is a very important causative factor for Dry Eye Disease. It reaches from easily detectable clear morphological changes of the eye lids ,such as advanced ectropion or entropion and facial nerve palsy, to more discrete changes such as incomplete blinks. Blink analysis in general is not so easy because, when the patients notices this investigation it may inevitably already influence the blink pattern. Incomplete blinks are probably the most frequent type of LBD and are more widely expressed even in apparently normal patients as one would assume. This assumption is however based on the fact, that incomplete blinking is often very discrete. But even then, the formation of a completely renewed tear film is already impaired and therefore the normal tear film physiology already disrupted ... with an inherent risk for the onset of Dry Eye Disease. Incomplete blinks are thus often only noticed with the help of a slit lamp or of a more advanced equipment such as a topographer. Most convenient is, when the analysis of the blink pattern can be done together with analysis of the Tear Film Lipid Layer (TFLL) and evaluation of non-invasive tear film break-up time (NI-BUT). Automatic analysis of the Blink Pattern is, however, typically not available in topographers or other devices for the investigation of the tear film or of the tear film lipid layer (TFLL). An exception is the Lipiflow device (TearScience Inc.) that automatically records the thickness of the TFLL together with its reformation during the occurring blinks. Thereby the frequency and the fullness of the blink movements of the eye lids are recorded.